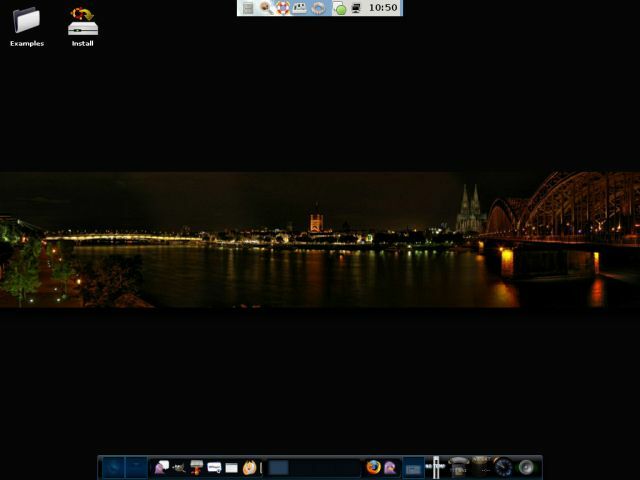 openGEU is another extremely successful Ubuntu child, running Enlightenment 17 as the desktop manager. 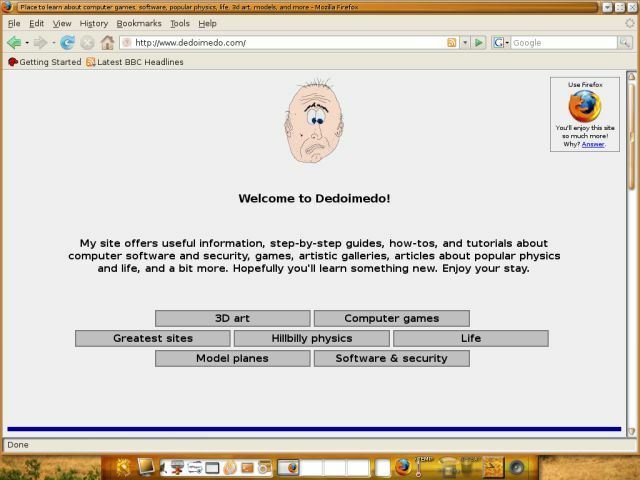 Like gOS, another Ubuntu & Enlightenment distro reviewed some time ago here at Dedoimedo, openGEU offers a healthy refreshment of color and choices to the already well-established distro. Like I have said before, Ubuntu is probably one of the smartest choices for the new Linux users, while it won't keep the veterans hanging in the dry. Enlightenment is a radically beautiful windows manager, very low on hardware demands. Combined, the two offer a new angle at productivity versus style. We're on familiar grounds here. Ubuntu distro means a single, bootable CD with all the goods you can need, no unpleasant surprises. You can test all aspects of your system and hardware before committing the distro to an install. Like most modern distributions, it boots into a 1650x1050px desktop, which is way too much for my aging eyes. Changing the distribution via the desktop options did not work, but this should hardly bother anyone. Manually reconfiguring xorg and restarting the X Windows works. I found the solution in the traditional Linux way - the command line. Without breaking the rhythm of the article, here's the briefest explanation how I did it, although a separate tutorial might be in order. Switched to a text terminal (Ctrl + Alt + F1). Started X Server configuration wizard by sudo dpkg-reconfigure xserver-xorg. Marked only desired resolutions (in my case, up to 1024x768px only). Returned to the graphical terminal (Ctrl + Alt + F7). Restarted the X Server (Ctrl + Alt + Backspace). Ah, so much better! 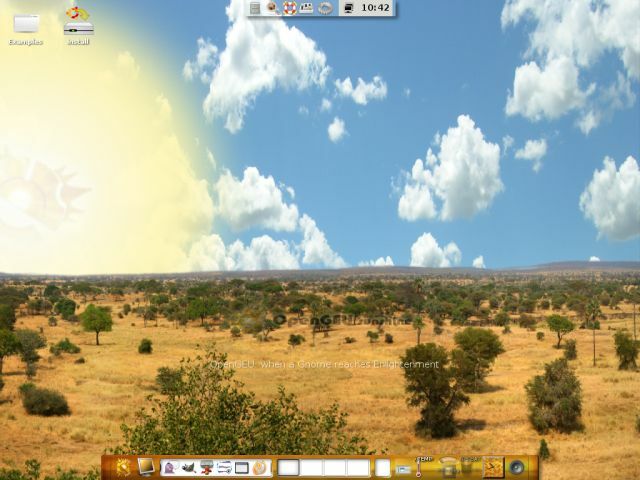 The default theme is the lovely Sunshine theme, saturated with soft brown and blues, giving the desktop an open, airy feeling. Let's focus on the bottom panel. The sunshine button on the left side will start a menu with links to everything. The layout of the functions is very similar to gOS so once you get the hang of Enlightenment, it should be a breeze. 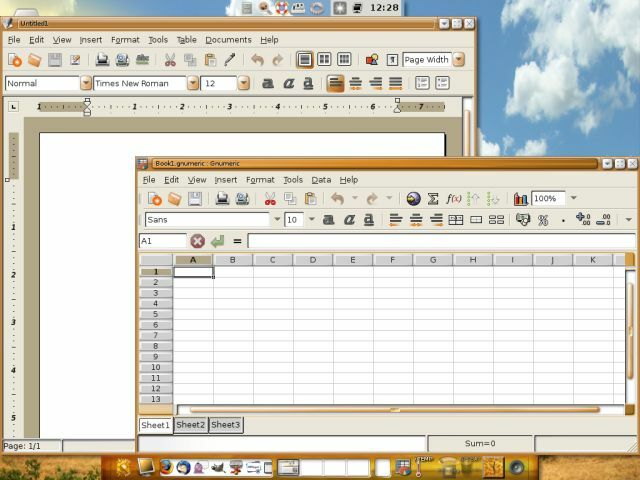 Icons to popular applications are pasted on a scrolling ribbon next to four virtual desktops. 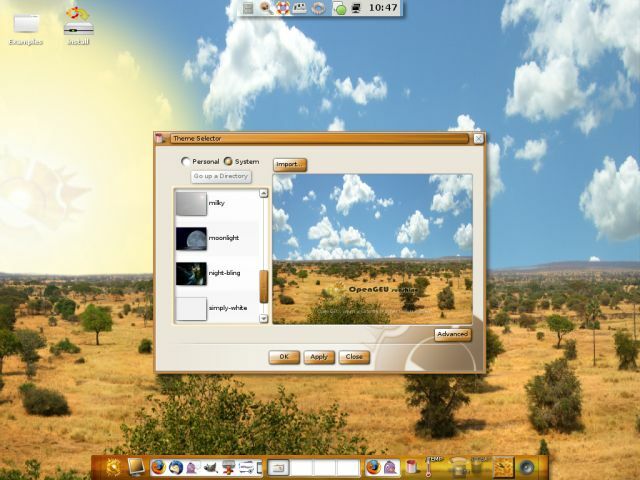 Several widgets are located on the right side of the panel. 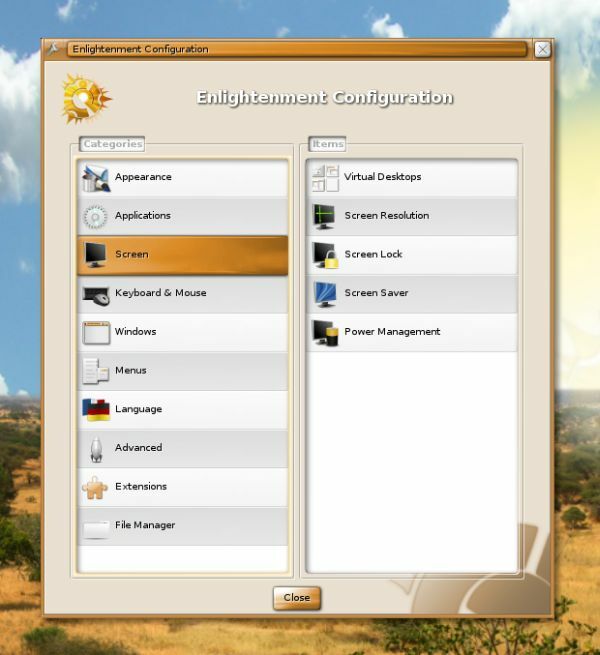 Launching the Configuration Panel starts a system-wide control center for the Enlightenment desktop manager, which allows the user to change the settings of windows, menus, peripherals, language, and more. System settings can be accessed via the top panel. In this regard, openGEU is almost identical to standard Ubuntu running Gnome. The full appeal of Enlightenment 17 comes to light when applications are launched. The orange-brown hues are soothing. Using openGEU will make you happy. For some reason, while testing the distro, I fired up Toto - Africa. The Serengeti motif both in the scenery on the wallpaper and in the lyrics of the song fit oh so well together. Notice the transparent terminal and the powerful, lightweight Thunar file manager. Icons of launched applications will also show up right of the virtual desktops filmroll, allowing you to quickly scroll between them. One of the strong sides of openGEU. The distro comes with fantastic art - and it's only a mouse-click away. Changing the theme is nothing unusual in most distros - but in openGEU, it comes with a complete new set of artwork for each one. Theme Selector allows you to quickly switch between them. There are others too, each offering a unique set of icons and animations. Notice that the a-la Start button changes to reflect the theme choice. For instance, with Milky, it's a carton of milk. openGEU is fast. Despite its astounding graphics, Enlightenment is a surprisingly lightweight manager, allowing openGEU to run on machines with slow processors and weak graphic cards. 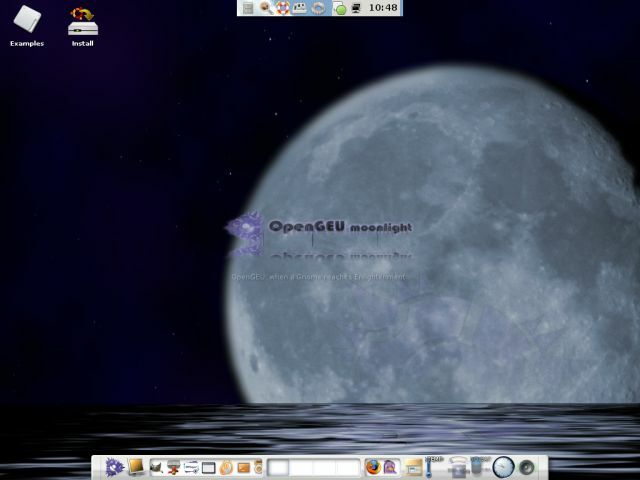 This makes openGEU a superb alternative to Xubuntu, the usual choice of Ubuntu users with old computers. Let's install it! The installation is a typical Ubuntu, so I will not go into details. Once the installation is complete, openGEU will boot with a cool splash screen. While the live CD would not change the screen resolution, the installer correctly applied the manual xorg settings to the installed system. openGEU is a Ubuntu like any other. You will receive updates, and be able to use APT and Synaptic to configure the system. A few more screenshots of some of the handy applications that come with the distro - MPlayer, Brasero burning application, AbiWord processor, and Gnumeric spreadsheet, just a few of many great programs. 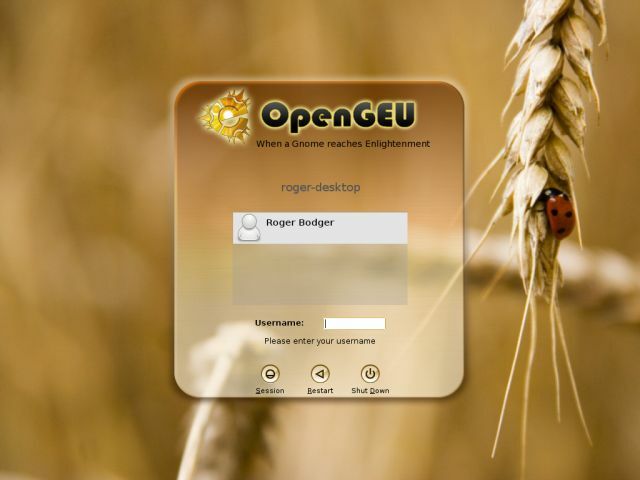 openGEU - home page and download links; formerly known as GEubuntu. gOS - a very good OS - Overview & short tutorial - another article of mine, covering gOS. Installing (K)ubuntu Linux - Full tutorial - one of my articles covering Ubuntu with KDE. Installing Linux Mint - Full tutorial - one of my articles covering an Ubuntu-based distro. By now, you may have probably guessed that I like Ubuntu quite well. 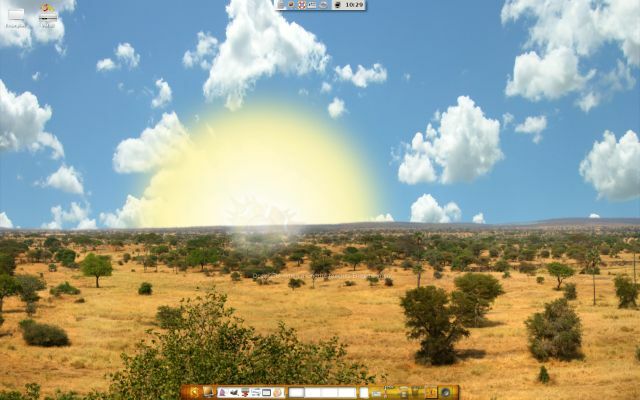 openGEU is an excellent choice for Ubuntu users who want a bit of a change from their distro. openGEU surprises with a pleasant choice of colors, excellent performance and the usual friendliness and ease of use that have become the trademark of the Ubuntu world. There are some minor quirks that need to be polished - but we must remember that Enlightenment 17 is still a BETA! Given the reputation of Ubuntu distros in the last 3 years, with each half-month release becoming better, more stable and more finely tuned to the needs of a broader range of users, the little bugs are likely to be ironed out in the next release. The distro balances well between stunning 2D effects, low demands and a solid choice of programs aimed at below-average machines. All the needed applications are just a few mouse clicks away, thanks to the powerful integrated package management system. The themes greatly complement the distro, wrapping it in a rainbow to fit all the moods. See you around! Meanwhile, enjoy openGEU.